As I’m using Red Heart Super Saver, I don’t believe blocking will be the solution, but only a temporary fix. Better to rippit back now; I’d rather be proud of this accomplishment than hate it later. Today is a good day for taking this project on- I want to get back to the start of this pattern and have it fixed so I can move on. I got a 3-mile walk in this morning, while T-storms lurked in the distance; rumblings told of imminent rain which has yet to happen. The neighborhood is growing quiet as some of the Summer People return to their daily routines for another week. Another short week as we head in to Summer, this Memorial Day weekend was the best we’ve had in a while, and life goes on. The Alaska Jacket is coming along; I’m at the first pattern row and haven’t made a single miscount yet. Go ahead, click the image to see a close-up and the picture, too! Finally, the day has come to an end, and I’m back inside. We had a perfectly beautiful day. Went for a walk with the neighbor this morning at 9, a little later than usual. It was warm but nice, and we spotted a fox while out walking-it crossed the road in front of us, and when I called out to it, it stopped and watched us walk by-I spoke to it until it turned and cantered off into the woods. DH made me a bucket of soapy water and I scrubbed off the upstairs deck, (my Tree Fort) and then hosed it off in preparation for tomorrow when we will stain the deck. He got the front yard mowed and I planted some Roma tomatoes in a couple remaining pots. DH grilled out tonight-we had Italian sausages and roasted red peppers, which I peeled and sliced, then put into a container and covered with olive oil, a dash of red pepper flakes, and some dried basil for seasoning. I will use some of the roasted red peppers for my hummus recipes over the summer. YUM! We decided not to camp out tonight-it’s going to be a hot one tomorrow, and we didn’t want to wake up cranky and sweaty, when we have so much to do tomorrow. SOooooo, we’ve put it off for another day. 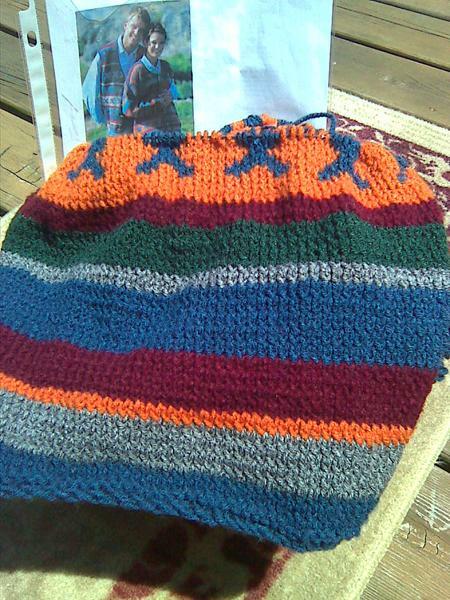 I got the X pattern completed today-Will post a picture when I can get a daytime shot. The only problem I think I ran into with the pattern is, when switching the colors, there are yarns that span the spaces between colors. 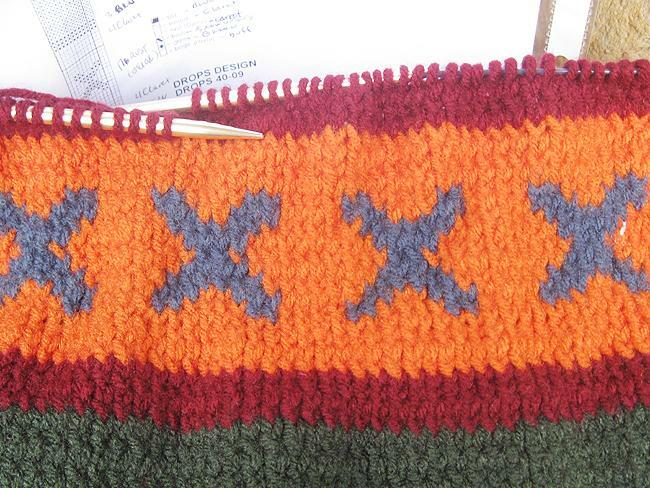 I have found that when I pulled those cross-over yarns, I created a little too much tension, and some of the X’s are a bit tight. 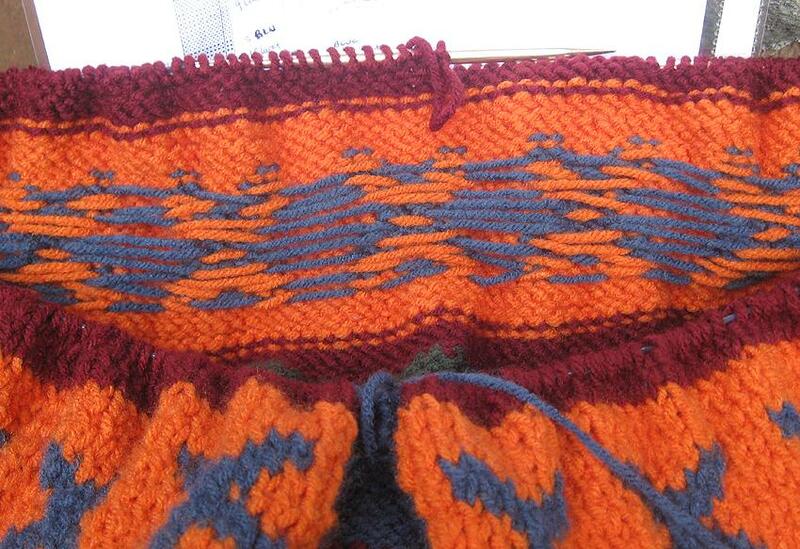 I think I may be able to pull out the slight puckering in some, when I block the finished jacket. I have another row to do further up in the shoulders and on each sleeve, so I hope to perfect the tensioning while changing colors, so as to avoid the slight pucker. Time to check out for the night-tomorrow is a new day! Sunday was a day of rest-we got up, showered, then hung out; I baked the rest of the day. This recipe is so easy, it’s fool-proof! 2 frozen deep dish pie crusts. Pre-heat oven to 425°. In large mixing bowl, combine rhubarb, sugar and jello packet, toss until coated. Pour into 1 deep dish pie crust and add a few pats of butter on top of fruit. Cover with second pie crust and seal edges with fingers-the crusts will thaw quickly, so don’t wait too long to remove top crust. Wet your fingers to help seal the edges. Bake 40-50 minutes on a foil-covered round pizza pan, it will get messy. Let pie cool, it will be incredibly soupy. Then refrigerate until ready to serve-the jello will set once the pie is cooled. The best pie is a messy pie!! DH took me to Ben Franklin Crafts, in Delavan today. I got the rest of the yarn needed for the Drops “Alaska” Vest and Jacket I’ll be working on over the next few weeks. These are the colors I’ve picked for the Jacket. As you can see, I couldn’t wait to get started and have already cast on my jacket. I also picked up some circular needles and a set of #6 DPNs for a Wonderful Wallaby Jacket! I took Elizabeth Zimmerman’s recommendation (pg 4), ” You will never need anything other than a 16″ (hats and sleeves) and a 24″ (body of work) needle in any given size.” I got 29’s, ooops! Susan Bates will be happy with my selection, and I’m sure I will be happy too. 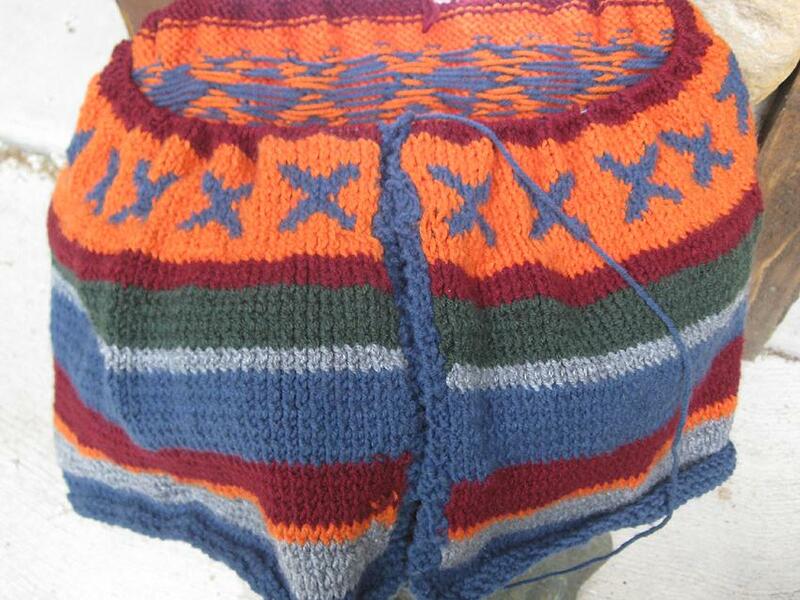 And when I’m done with all that, I’m sure there will be yarn left over for a pair of Wisconsin Winter Socks too!